It was going to be either London Zoo or Whipsnade Zoo today but it turned out to be neither. Instead it was Hampton Court Palace. The weather was wonderful. Bright sunshine, with a hint of winter. This great weather certainly brought out everyone on their bikes but not mine sadly as it was left at home. Crossing bridged over the Thames I saw a sign that said Tower Bridge 29 miles. I wonder what this would be like to do? 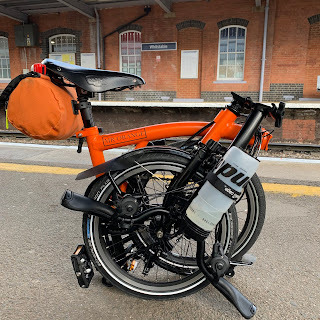 Instantly I thought to myself that I'd like to have a go but I wonder what the cycle path would be like for the small but perfectly formed wheels on a Brompton. (Anyone reading this who knows please make a comment). I am in the market for a new waterproof cycling jacket. I do have a bright orange one (see one of my older posts for more details) but I haven't dared to wear it out in anger more than once. Me thinks bright yellow might be better? What do you think? I recently bought a bright yellow jacket from chainreactioncycles. I am very satisfied. It is an Endura Gridlock Jacket. Just had a look at that one and it might just be what I am looking for. Either this or something my Altura but will have to decide soon.